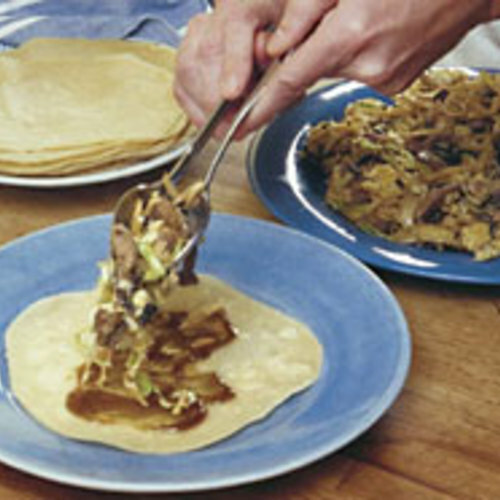 These thin pancakes are used to wrap up the Mu-shu Pork filling, and the recipe can be doubled easily. 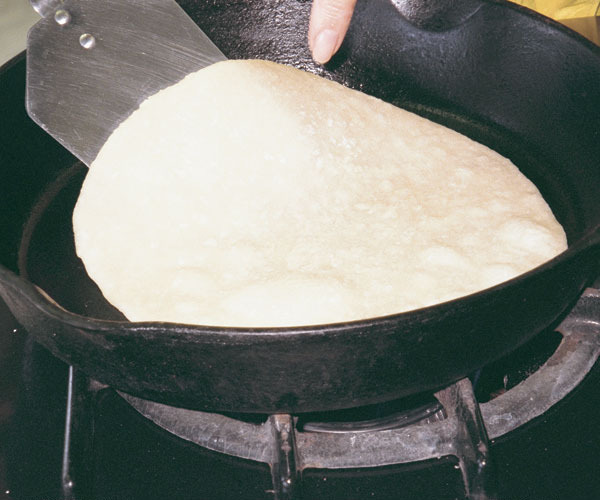 After cooking, the pancakes may be refrigerated for three to four days or even frozen until ready to serve. Steam them to reheat. 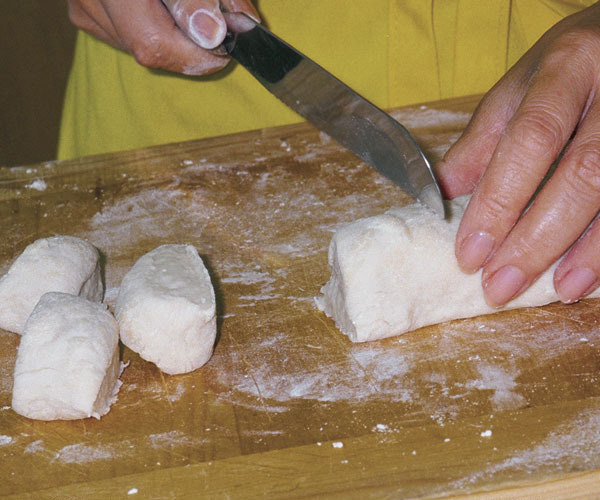 In a bowl, mix the flour and the boiling water with chopsticks or a wooden spoon to combine. Turn the shaggy dough onto a lightly floured board, gather it into a heap, and knead it until smooth, about 3 min. Cover with a towel and let it rest for about 1/2 hour. Give the shaggy water-and-flour dough a quick knead to smooth it out. The dough needs a half-hour rest to make it workable. 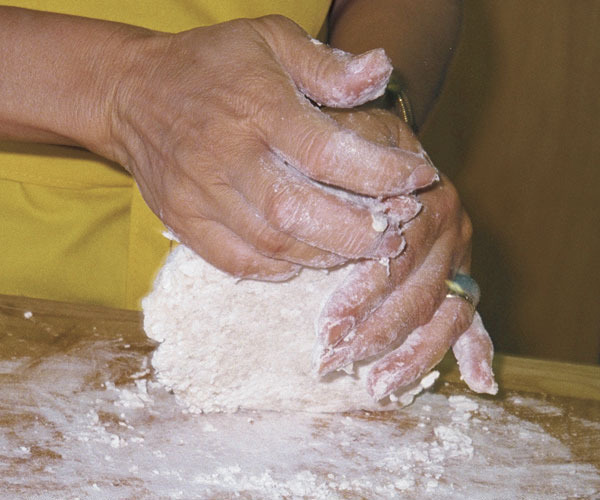 With your hands, shape the dough into an even cylinder about 12 inches long. With a sharp knife (I find gentle pressure and a serrated knife prevents squashing the dough), cut the roll into 1-inch pieces. If the cutting squashes any of the pieces, stand them on end and shape them back into rounds. Roll the rested dough into a 12-inch log. Cut the log into 12 pieces. 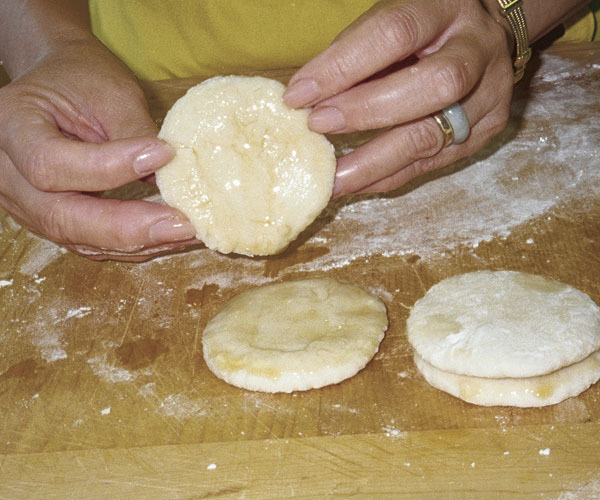 Lightly flour your palms and use them to flatten the pieces into 2-inch rounds. Brush the top of each round generously with sesame oil. Lay one round on top of another, oiled sides together. Flatten the pair together with the heel of your hand. Continue until you have 6 pairs. Flatten each piece into 2-inch rounds, oil them, and pair them off. Press the oiled sides together to make a total of six sandwiches. 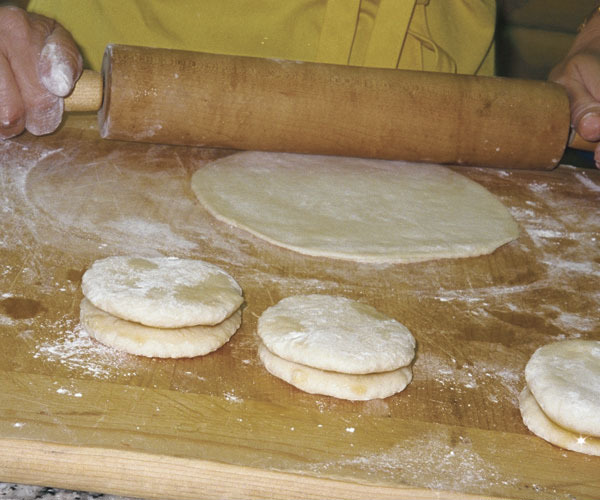 With a floured rolling pin, roll each pair into a thin pancake about 7 inches in diameter, flipping the pancake over now and again to roll evenly on both sides. Stack the pancakes as you finish rolling them. 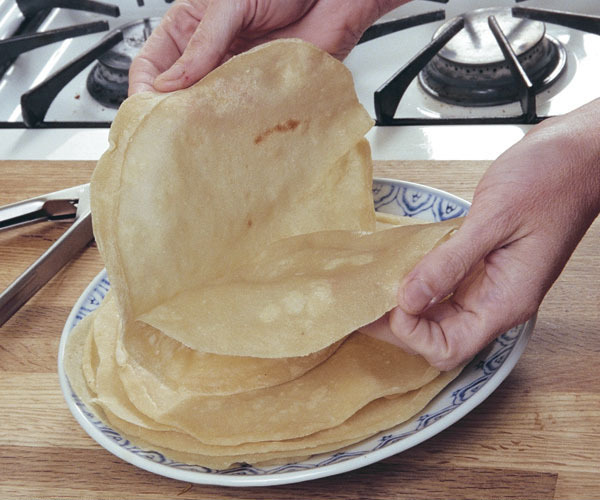 Roll each pair into one thin pancake, 7 inches across. Flip the pancake over as you go for even rolling. In an ungreased cast-iron skillet or nonstick pan over medium-high heat, cook the pancakes one at a time. Heat one side until it becomes less opaque and starts to bubble slightly, and just a few brown spots appear, about 1 min. Flip it over and cook it until a few light brown spots appear on the other side, about 30 seconds. The pancakes get cooked one at a time. You could say two at a time, since one gets split into two. While the pancake is still hot, pick it up, look for a seam to grab, and separate it into two very thin pancakes. Stack them on a plate as you go and wrap them in foil to keep them warm and prevent drying. If not using right away, refrigerate until ready to use. While the pancake is still hot, find its seam and peel it into two. The author is used to the heat, but you may want to wear rubber gloves to keep from burning yourself. Really great! Make sure to roll out very thin. 12 discs made pancakes too big for me. Had to cook longer and they dried out a little. The thinner the pancakes the better they turned out. Taste perfect! Love this recipe! I have made it three times. It's easy, it works beautifully every time and it tastes so much better than store bought.